T What is not to love about this iconic island? So, when John asked Tanya to marry him during their annual family trip, there was no debate about the place that would seal their love and their journey as husband and wife would commence; Santorini. Tanya and John flew in with their closest friends and family to celebrate the beginning of their new life in the most romantic scenery at Cavo Ventus Hotel; all dressed up in dreamy pink hues and some bold dark blue elements to make a true islandish statement. Beautifully curated by Julia and Evita from Santorini Glam Weddings, this wedding was everything a girl could ask for. 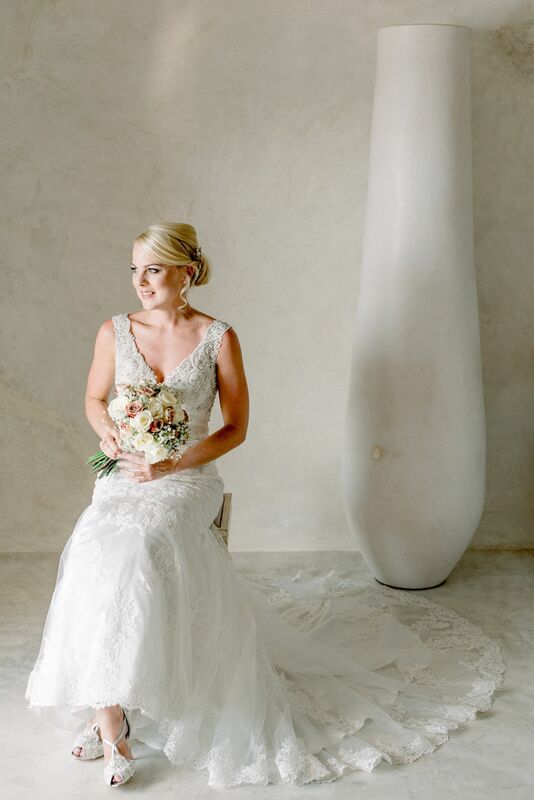 Tanya’s wedding vision was brought to life by the experts and we were there to capture all this prettiness! Although this was a challenging day due to the severe winds blowing on this beloved island, the ceremony was still impeccable. A canopy wrapped in pink textile and embellished with roses against the clear views of the Aegean on the top of a cliff was nothing sort of magical. Tanya and John exchanged their vows in a sentimental ceremony among their family and friends while warm light allowed for some breathtaking photographs. The celebration dinner was intimate as guests sat across a long table. You could feel the genuine love in the atmosphere, you could hear the heartfelt laughter everyone shared and understand the tears of joy from the bride. Minimal décor is needed when the scenery is so captivating. Following on from the ceremony décor, scattered rose gold pot filled with romantic rose and white roses where placed on the dinner table. 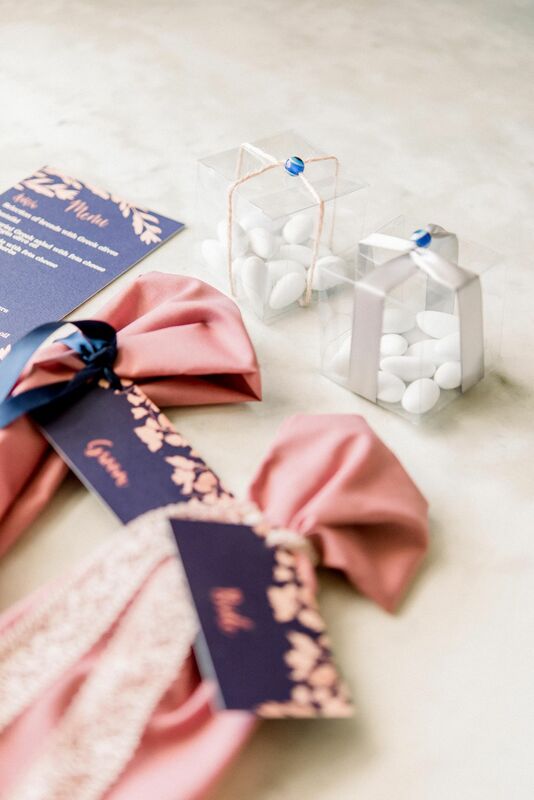 We loved the little details; the personalized place cards, the thoughtful wedding favours with traditional sugarcoated almond sweets and of course, who couldn’t notice the bold dark blue with rose gold calligraphy going on in this sumptuous menu? Metallic elements, rose gold, pink hues and lots of roses made up for the dreamiest celebration in Santorini. Noticed the fair lights and lots of candles in the pictures? You can’t have a romantic wedding in Santorini without them! Taking it all in after their big day, Tanya and John decided to talk a stroll around Oia the morning after. And what a delight that was! Having a next day photo shooting allows you to relax and indulge in your new status as a married couple! And those two loved every minute of it! Who wouldn’t like having their postcard like pictures the first day as Mr and Mrs afterall? Tanya and John enjoyed the morning light in Santorini, danced barefoot in the pebbled alleys and enjoyed the seas views holding each other tight; this was their new life. Could you imagine yourself indulging in these views? Let us know in the comments! Happy you like it George. « Back to our roots!